How do scientists test the evolutionary significance of behavior? In the absence of rigorous scientific research, sociobiologists can potentially fall back upon speculation, which can easily be biased by prevailing prejudices. Women are supposed to be subordinate to males; males are supposed to be aggressive. Therefore it is critical that rigorous scientific research support any claims as to the evolutionary significance of human behavior. Sociobiology relies on careful animal studies in which the frequency of any given social behavior can be correlated with some marker of evolutionary significance. For example, the frequency of altruistic behavior in baboons can be correlated with the degree of biological relatedness between animals, which will then translate into the proportion of shared genes (50 percent for parents and children, 50 percent for full siblings, 25 percent for half siblings, 12.5 percent for cousins). 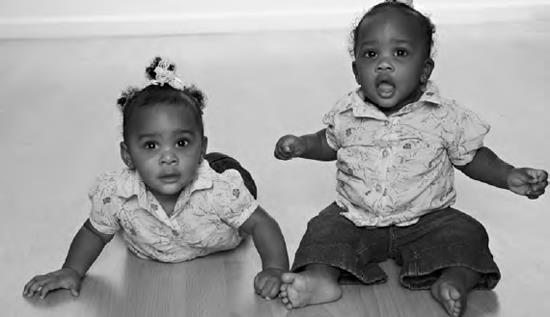 In humans, twin studies have been used to differentiate the effects of genetics from the effects of environment. Additionally, anthropological studies that compare social behavior across different cultures are also used in an attempt to separate the effects of genetics and environment. These studies become harder to do with time, however, as globalization leaves fewer cultures truly independent of each other. Studies comparing identical twins, fraternal twins, and non-twin siblings have been used in an attempt to tease apart the role of genes and environment in various psychological traits (iStock).